Get rid of your smartphone now. You are living in a digital dictatorship. Every thing you do on the internet is logged. In the background, you are being monitored, where you go, what you buy, what you write and even what you say. covert system. One day it will come out from the background and take over control of the population directly, in your face. Hu lost his social credit when he was charged with a speech crime and now finds himself locked out of society due to his low score. In 2015, Hu lost a defamation case after he accused an official of extortion. He was made to publish an apology and pay a fine but when the court demanded an additional fee, he refused. Last year, the 43-year-old found himself blacklisted as “dishonest” under a pilot social credit scheme. “There are a lot of people who are on the blacklist wrongly, but they can’t get off it,” says Hu. It’s destroyed his career and isolated him, and he now fears for his family’s future. The social credit system has closed down his travel options and kept him under effective house arrest in his hometown of Chongqing. In an apartment above the streets of Chongqing city, Hu tries to use a phone app to book train tickets to Xi’an. The attempt is rejected. “[The app] says it fails to make a booking and my access to high-speed rail is legally restricted,” he explains. Hu’s social media accounts, where he published much of his investigative journalism, have also been shut down. Hu claims his combined Wechat and Weibo accounts had two million followers at their peak but are now censored. Hu believes his blacklisting is political and has tried to appeal to authorities. So far he has been met with silence. Hu wants to warn the world of the nightmare of social credit. 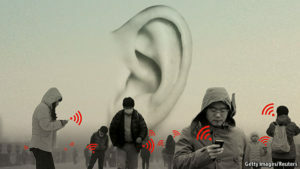 Doing so could put his friends and family at risk of reprisals from the state, but Hu believes most Chinese don’t yet understand what’s to come under the digital totalitarian state. “You can see from the Chinese people’s mental state,” says Hu. A social credit scheme run by Common Purpose cabinet office marxists for “the greater good” of course that would never happen in the UK would it ? The standout memory for me must be Julia Middleton’s session on Cultural Intelligence (CQ) on the first day of the programme. Although what we discussed seemed to be a simple model, it had a lot of relevance for us throughout the remainder of the week. When criminals do bad things they’re not stupid enough to leave a paper trail. All the hubristic idiots at CP have. Mwuhahahaha!!!!! Hmmm do you recall the banking scandals, the Enron crash, illiegal arms sales routing weapons to terrorists. All leave a paper trail and very few are punished. CP seddition and sabotage in the UK leaves a paper trail and very few are punished. The blog that's fed by you, the readers. Send in the stories that interest you. "My part in Crimea's escape from NATO"
Articles posted here are for your consideration at your discretion. No purported facts have been verified. Articles do not necessarily reflect the views of the poster nor the site owner.